The boarding process at JNB had been a bit of a nightmare - no wonder they start it so early! - but eventually I was able to settle into 2A, with a glass of apple juice and a somewhat non-standard mixture of macadamias and cashews. My amenity kit arrived, complete with an aromatherapy sleep aid which meant that, of my four BA F flights in 2007 to date, only the LHR-inbounds provided this feature. Most odd! On this occasion, I decided to change into my PJs on the ground. The doors were closed at 2013 and the cabin was sprayed with a horrid insecticide. We pushed back at 2027, but take-off was a full twenty minutes later. As we had taken off towards the south, a full 180-degree about-turn was required. 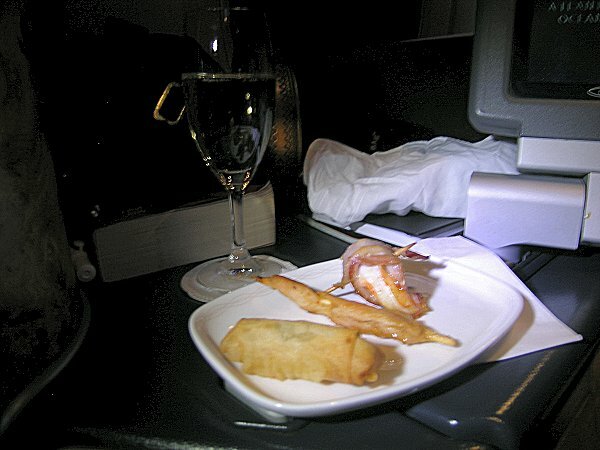 Once airborne, I had my customary glass of Champagne to accompany what I thought was a rather fine selection of canapés, consisting of a spring roll, a piece of chicken and a king prawn wrapped in bacon. 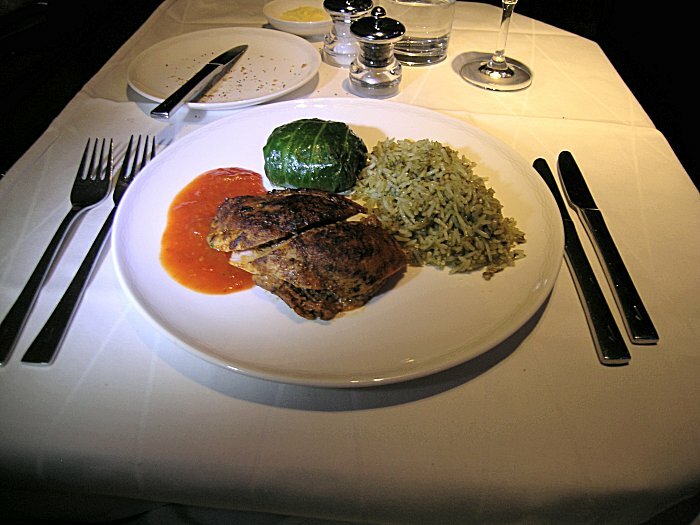 The drinks orders and meal orders had all been taken prior to departure. 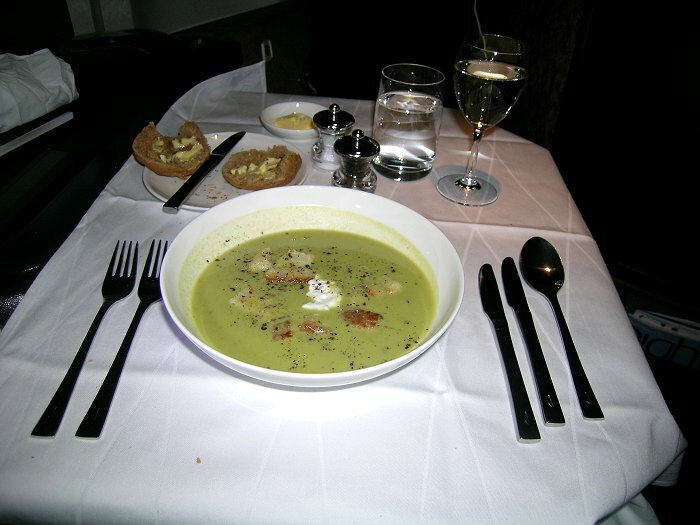 I had the soup, followed by the chicken, both of which were very good indeed. By now, I was drinking the Sancerre. I decided to have the cheesecake for a change, but found it surprisingly heavy and didn't quite manage to finish it. I ended with my usual sleep-friendly blackcurrant tea. I slept reasonably well, though not continuously, finally waking up at 0420 UK time over a bumpy Mediterranean. I noticed that we over-flew both Sardinia and Nice. 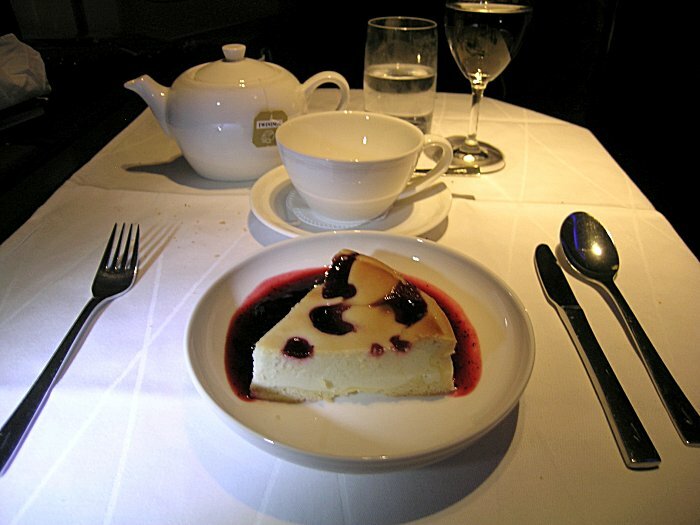 Having changed back into my normal clothes, I enjoyed a breakfast that was remarkably similar to the one I had on BA55 : orange juice on this occasion, followed by Fruit and Fibre, followed by scrambled egg on toast with bacon, all washed down with Earl Grey tea. Lovely! We made two circuits in the stack over South-East London, which I'm sure didn't do Bruce's nerves much good, given that he had a tight connection onto United at Heathrow. We eventually landed on 09L at 0635, making it onto stand by 0644.